Is your lawn browning, having trouble bouncing back from foot traffic, or simply refusing to grow? You could have a grub problem. If you’re dealing with an abundance of lawn grubs, here are some ways that you can treat and prevent the problem. How do I know if I have lawn grubs? Dead brown spots and weak grass aren't always signs that you have grubs; they can also be signs that your lawn is under watered or over fertilization. How, then, can you tell if your problem really is grubs? The only way to tell if you have grubs is to find some. If your grass is weak, see if you can remove a section simply by pulling on a clump of grass. If the clump doesn't come free, use a spade or shovel to remove a small sample of grass. When you remove a clump of grass look at the soil for small, white grubs. They will by lying in a “c” shape and will be hard to miss. If you only spot one or two, you may not have a grub problem and should sample other areas of your lawn to see if you can spot any. If you see more than eight, then you’re lawn is definitely infested. How do I get rid of lawn grubs? Getting rid of grubs is easy enough; all you have to do is purchase a grub pesticide from your local gardening or landscaping store. There are many different types of grub pesticides, so choose the best option for your home or lawn. Be careful not to de-grub during the spring, as this is the time when they are largest and aren't really feeding anymore. Plus, heavy rains during the spring will only wash away any pesticides you lay down. The best time to get rid of grubs is late in the summer or early fall, because the grubs are still small and hang out close to the surface. Preventing Grubs – Grubs in themselves aren't bad for your lawn; however, large quantities of them can be. The best way to prevent a large number of grubs from moving in is to keep your lawn dry. 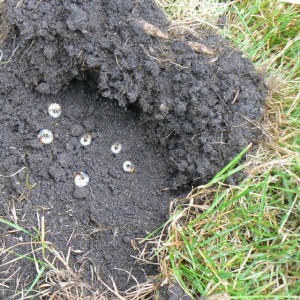 Grubs like moist, dark places, so if your lawn is over watered, you’ll be sure to see an onset of grubs. Water only enough to keep your lawn hydrated and no more.